Sunlight cascaded on Julia, giving her the perfect light to read. She sat under a tree, quite comfortable, even with a slight nip in the air. Bright colored leaves blanketed the ground, and birds chirped in the tree branches over her head. For the last hour or so she had pored over the notes and invitations to tea and various social functions from many names she didn’t recognize. Most addressed to her mother and made no mention of her. She should have been insulted, but she guessed it was to be expected. She had never been adept at forming new friendships, and had relied on David and Maria for companionship. But now with them both gone from her life, she would have to search elsewhere for company, or turn to Isaiah for companionship. “I’m so lonely.” She stared at an invitation written in bold, yet feminine handwriting. The words blurred on the page and she swiped away at her eyes. Enough with the tears. Crying made her head throb and her face red and splotchy. She cleared her throat and scanned the paper on her lap. Her eyes widened as she absorbed the information on the invitation from the countess Guetall for her holiday party at the de Fleurre estate the first Saturday of December, which happened to be in less than ten days. A leaf landed on her skirt. She flicked it away, inspecting the dull cotton fabric in repugnance. Most of her wardrobe consisted of drab-colored gowns and dresses. Her only suitable dress for the countess’s party was a buttercup-colored gown she wore at the ball her parents had hosted to introduce them to Flaundia society. It made her look pasty, unfortunately. For some reason her mother felt yellow suited Julia. It had always been the case because Ramona’s wardrobe consisted of brightly colored frocks. Also, Ramona would have pitched a fit if she dared outshine her. But no longer! If she so choose, she would wear whatever colored gowns she wanted and Ramona wouldn’t be there to criticize or have some sort of tantrum. What a shame she couldn’t fit into any of Ramona’s dresses. Ramona was petite and curvy, unlike her own tall and lanky frame. She jerked upon hearing the breathless-sounding female voice. The papers almost tumbled from her lap as she stared at the woman standing over her. The glare of the sun blinded her, and she shaded her eyes to get a clearer picture of her visitor. Her jaw dropped. Not only because this lady knelt before her, possibly staining her skirt with grass and mud, but because she was struck dumb by this beautiful, vibrant woman with a halo of hair bursting with radiant color. The heavy-lidded, dark brown eyes staring at her in friendly concern had long, thick eyelashes. Her skin tone darker than most gentile ladies, she had a swanlike neck leading into a chest hidden by a tight riding jacket. Even with the lady’s bosom covered, she found much to admire there. “Oh, do people not shake hands in this section of the country?” the countess lowered her hand on her knee and shrugged in an apology. She pressed her lips together and climbed to her feet. the countess joined her and continued staring at her in an acute way that made her face warm. the countess’s lips twitched, and eyes she couldn’t stop staring at lit up in amusement. 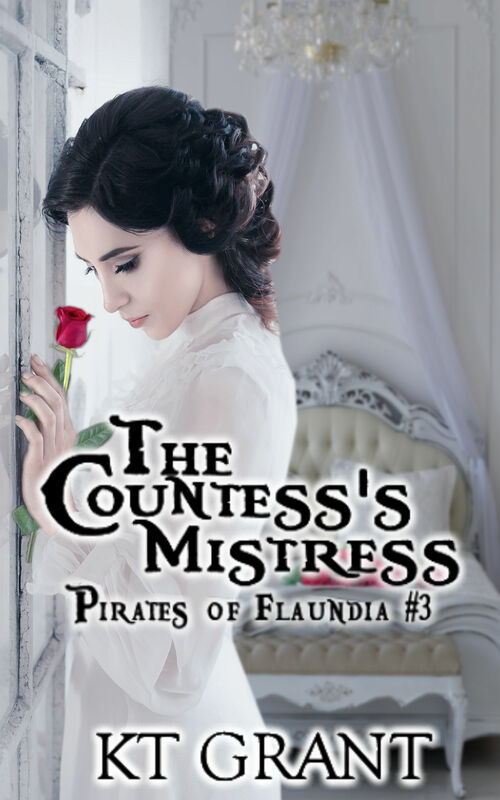 This entry was posted in Uncategorized and tagged Countess, KT Grant, Lesbian, Lesbian Historical Romance, Pirates of Flaundia, Widows. Bookmark the permalink.